Description Pack of smileys for use with nConvers++ plugin v0.0.0.4.8. 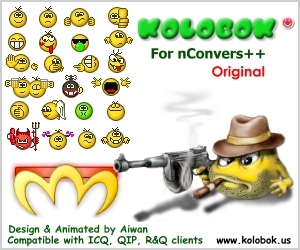 Should be compatible with ICQ clients, QIP, R&Q and other popular code. Special thank for Compiled code NeoJSmith. Render time: 0.0897 sec, 0.0106 of that for queries. DB queries: 20.